Iceland’s erupting volcano, Eyjafjallajokull, is putting enough volcanic ash and moisture in the air that it may potentially have affects on the global climate. This is especially true if neighboring volcanoes also erupt. While some volcanoes aren’t powerful enough to really influence the global climate by blocking out sunlight at the higher levels of our atmosphere, it’s volcanoes like Eyjafjallajokull that have scientists and meteorologists busy monitoring possible affects on our environment. The most important global impact from a major volcanic eruption is the lowering of temperatures, which has been seen before with big volcanic eruptions. 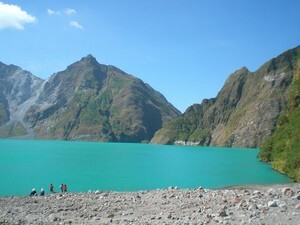 One of the most recent events of a major volcano contributing to global climate change is the 1991 eruption of Mount Pinatubo in the Philippines.